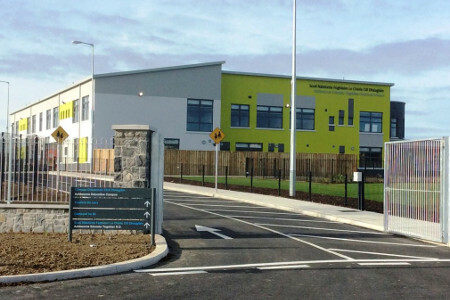 New two storey 450 pupil Post Primary School with SNU facility, GP hall, library/resource room and other ancillary accommodation; an external construction studies covered area and storage space; a secure hard and soft special play area; 3 No. enclosed ballcourts with related fencing and gates to facilitate use as overflow car parking; 43 No. car parking spaces, 5 No. disabled parking spaces and related vehicular access. New two storey 16 classroom Educate Together National School with SET facility, GP hall, library/resource room and other ancillary accommodation; junior play area, SNU garden and soft play area; 2 No. enclosed ballcourts with related fencing and gates to facilitate use as overflow car parking; 39 no. car parking spaces, 2 No. disabled parking spaces and related vehicular access. New two storey 16 classroom Gaelscoil with SET facility, GP hall, library/resource room and other ancillary accommodation; junior play area; 2 No. enclosed ballcourts with related fencing and gates to facilitate use as overflow car parking; 39 no. car parking spaces, 2 No. disabled parking spaces and related vehicular access.